A cake has always been an integral part of any occasion since the 19th century. Whether a wedding dessert, a birthday meal, anniversary feast, success celebration or Christmasspread, cutting a cake has different meanings for every occasion. From rich and elaborate layers of cream to a traditionally baked sponge cake, it is a ‘must-have’ for every social function. A cake is also considered as one of the best edible presents, representing a gift of sweetness enriching one’s life. We help you choose premium cakes with a wide variety of customized cakes to choose from. If you’re away from your loved ones who stay in Bangalore or Delhi and the North, to congratulate them on any occasion, express that you miss them, or just appreciate their presence in your life, then send this delightful surprise to brighten and add sweetness to their day. Choose from a variety of flavours and customized designs. Whether your loved one is a vanilla admirer, coffee addict or swears by chocolate, just make his day more delightful by choosing his preferable flavor and we’ll deliver it right at his doorstep. 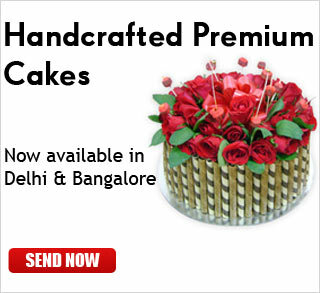 Order now for quick cake delivery in Bangalore or Delhi, Gurgaon, Faridabad, Ghaziabad and Greater Noida.